14 years after SWAT hit movie screens � and six years after its first direct-to-video sequel - we get another film via 2017�s SWAT: Under Siege. Or is this a prequel to the rebooted SWAT series set to debut later in 2017? Under Siege appears to be an extension of the cinematic franchise, though beside its title and general premise, it seems to share little connection to its predecessors. 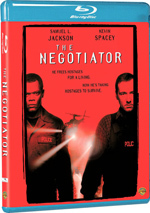 SWAT and DEA agents pair up to apprehend members of a drug cartel, an action that results in a massive firefight. In the midst of this, SWAT member Travis Hall (Sam Jaeger) takes in a prisoner known just as �The Scorpion� (Michael Jai White). This leads to a mix of complications that force Travis and others to fend for their survival. Don�t expect that synopsis to mean much, though, as Siege fails to concern itself much with story or character areas. A basic reworking of the framework set up by 1959�s Rio Bravo, the film focuses on action and violence to the exclusion of most other domains. To a degree, this works, as Siege manages a few reasonably exciting scenes. It throws tons of combat scenes at us and pulls them off with moderate aplomb. However, Siege doesn�t stage these sequences with any real creativity, and the absence of character/narrative depth becomes a real drawback. If we don�t invest in the participants, we don�t care what happens to them and we lose interest in the final outcome. In addition to the thin story and flat characters, Siege suffers from soap opera-caliber acting. Jaeger and White maintain good �action star� capabilities but they lack real chops otherwise, and Palicki seems downright embarrassing as a police inspector. Every once in a while, Matthew Marsden�s Lars � the main villain of the piece � threatens to show signs of a pulse. However, Marsden plays the role as such a Hans Gruber knockoff that he fails to elevate the role. SWAT: Under Siege comes with enough decent action to make sure its 89 minutes pass painlessly. I wouldn�t call that an endorsement, though, so don�t expect much from this mediocre police drama. SWAT: Under Siege appears in an aspect ratio of approximately 1.78:1 on this Blu-ray Disc. This was a generally positive presentation. Sharpness looked solid. A few shots were slightly soft, but not to a substantial degree. Most of the movie seemed pretty accurate and concise. No jagged edges or shimmering occurred, and I saw no edge haloes. Source flaws were a non-factor, as the movie stayed clean. Like most modern action flicks, Under Siege favored a blue tint with a dollop of orange as well. The blue became a pretty heavy overtone and we didn�t get much room for other hues. Within their parameters, the colors appeared appropriate. Blacks seemed deep and tight, while shadows were decent. They could be slightly dense � mainly in nighttime scenes - but they remained positive for the most part. In the end, the transfer proved to be good, if not great. As for the DTS-HD MA 5.1 soundtrack of Under Siege, it became a peppy mix. With all the action scenes, we got a lot of good material from all sides. Gunfire and other elements zoomed around the spectrum and added a nice sense of activity to the film. Stereo music also worked well, and this turned into a pretty vivid soundscape. Audio quality seemed fine. Speech was crisp and distinctive, with no edginess or other concerns. Music was full and rich, while effects came across as lively and accurate. The track boasted good low-end when appropriate. All of this was good enough for a �B+�. The disc opens with ads for Kill �Em All, The Marine 5: Battleground, Resident Evil: Vendetta, Starship Troopers: Traitors of Mars, Feed and Avenging the Zodiac. No trailer for Siege or any other extras appear on the Blu-ray. At times, SWAT: Under Siege provides reasonable action excitement. However, the movie seems far too derivative and uninspired to become anything better than meh. The Blu-ray offers fairly positive picture and audio but lacks supplements. Under Siege winds up as mediocre action fodder.